In order to stay on informed with the latest in advertising technology, Ready Artwork makes it a priority to test out the latest software and platforms out on the market. This time around, a Facebook advertisement about an advertising platform that monitors conversations on social media in real time and is able to optimize and automate ads. It piqued our interest and we decided to give it a shot. For $100 to use the platform plus a percentage of our ad spend, it felt well worth it to give it a try. Unfortunately for us, the experience went from bad to worse. Keep reading to see how it unfolded. We decided on starting out on Needls by creating a Facebook ad campaign. After getting our ideas for our campaign, the graphics, ad copy, and landing pages, the process went smoothly. 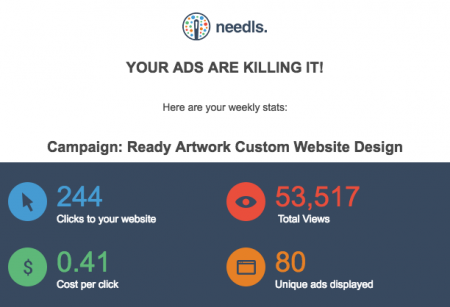 The Needls platform is simple and straightforward and setting up a campaign is easy with far fewer steps than setting up an ad on Facebook’s Power Editor. We ran into our first problem. We launched the ad campaign on Friday afternoon and it takes 24-48 hours to go live. The problem was, there was an error when granting access to our Social Media advertising account. 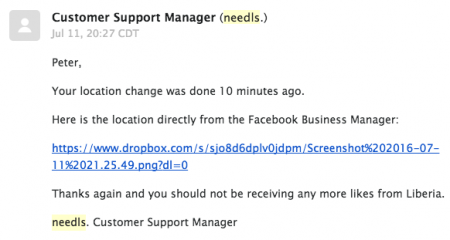 We reached out customer support but didn’t hear back from them until the following week. An example of the setup process taking 48+ hours. They worked on our request and our campaign finally went live. Had we not reached out to them, there’s a good chance our campaign would have been on hold. We ran into our second problem. Once our ad went live, we kept receiving post and page likes from people from the country of Liberia. It had us puzzled. We then realized that even though we had targeted our location as ‘Monrovia, CA’, the platform had targeted ‘Monrovia, Liberia’. An entirely different geographic location! We reached out to customer service and informed them of the issue. We gave them the benefit of the doubt (it seemed mightily convenient that it was fixed at the exact time I reached out 5 hours later) and let the campaign continue to run. They did, however, later credit us $12 for the time that the ad was incorrectly targeted but only after I had reached out to them to ask for an adjustment. These are nice sounding numbers and we’re not sure if every ad ‘kills it’. We decided to pull the plug on the campaign after 1 week. We felt that we had gotten a feel for the platform itself but didn’t feel too confident about working with the company going forward because of their lack of communication. In addition to that, based on analytics, there were discrepancies between the number of clicks reported on Needls vs ones that we viewed on Google analytics using UTM parameters. We sent a request for cancellation and we could actually see their internal communication. We were classified as an ‘easy save’. 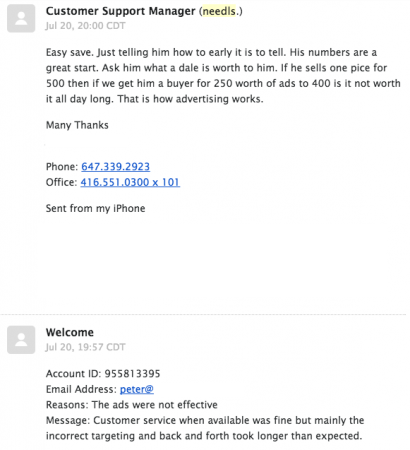 We expressed that the constant back and forth (us as the customer having to be so proactive) and incorrect targeting was the reason why we wanted to cancel but they really focused on trying to retain us as a customer by ignoring the customer service aspect and only focusing on our ad results. So we fast-forward a month and we get a bill for $20. Apparently, our account wasn’t cancelled and it was placed on ‘sleep mode’. We gave customer service another email and Needls customer support gave us a phone call. Their explanation was that since we had not explicitly told them, ‘we want to cancel’ a second time, the account was placed on ‘sleep mode’. Their reasoning is to preserve the account data and while on sleep mode, the account continues to draw information and data. During this phone call, we were told that we were making a big mistake because of these results and they were solely focused on that. We provided feedback about the lack of communication on their part and this last ‘sleep mode’ incident really sealed it for us and we lost interest in ever doing business with them in the future but the customer service representative kept trying to sell us on the idea of the results we had and new features. Needls. is a platform with great potential but as a customer, it was extremely frustrating having to constantly reach out to them and in the end we’re stuck with a $20 charge after sending an email requesting a cancellation of service. It also does not feel as ‘automated’ as it claims to be. With these issues that arise with incorrect targeting or errors with the initial setup, it seems to require more than just automation and adds additional time to the overall process. We also understand that there is a chance that our experience may differ entirely from others who have used the platform. We don’t recommend using Needls. since there are quite a few other advertising platforms that save time and provide much more control to the customer. 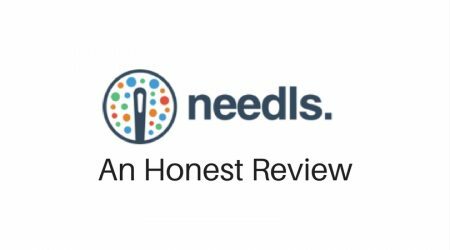 If you are considering using Needls, we recommend having at least an intermediate understanding of social media ads. 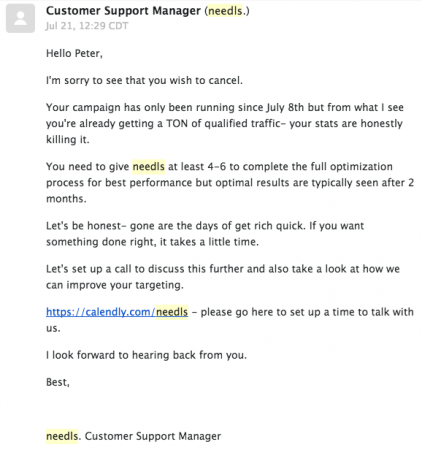 We also recommend clarifying as much as you can with Needls support before beginning a campaign.